Cardiac rehabilitation involves many facets of health and wellness. One of these is diabetes management which requires an interdisciplinary approach involving nurses, dieticians, and therapists. 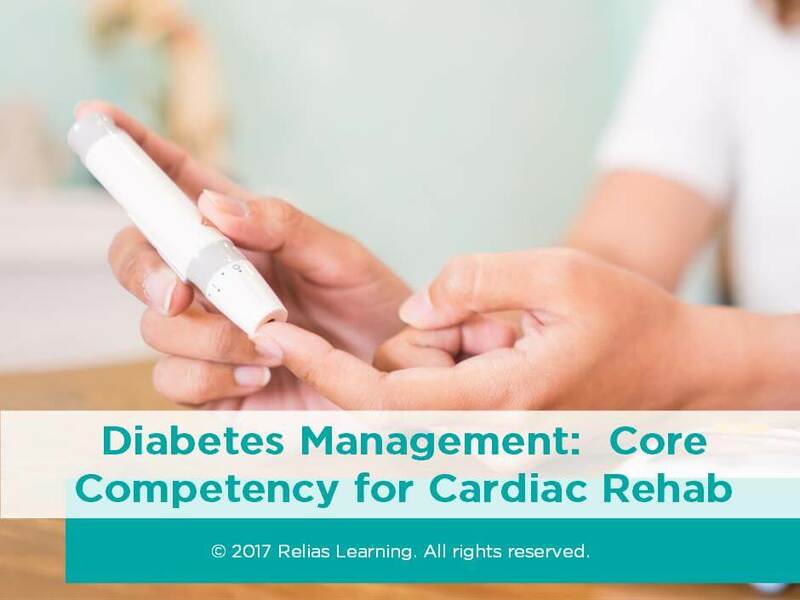 This module will review diabetes management as a core competency in cardiac rehabilitation. This course has been approved by the Alabama State Board of Occupational Therapy for 1.00 contact hours, approval number 20-605639. This course has been approved by the Florida Board of Occupational Therapy for 1.00 contact hours, approval number 20-605639. This course was approved by the New Jersey Board of Physical Therapy Examiners. Approval #: 1712-109. This activity is approved for 1.00 contact hours. This course is approved by the Ohio Physical Therapy Association, approval number 19S0013. This activity is approved for 1.00 contact hours. Describe 1 treatment option for diabetes. Describe physical activity concerns for one chronic complication of diabetes. Ms. Ackerman earned a Bachelor of Science in dietetics with a minor in science and food service administration from Central Michigan University. She completed a Master of Science in Clinical Nutrition at Rush University in 1993. She has 25 years of experience as a clinical dietitian and diabetes educator working in a variety of setting including large in-patient, teaching hospitals; community hospitals; county health departments and outreach networks. She currently serves as the coordinator of a disease management program and medical nutrition services for a community hospital and is also an experienced lecturer, presenting educational programs in a variety of settings. Her professional associations include the American Association of Diabetes Educators, and the Academy of Nutrition and Dietetics. Disclosure: Paula Ackerman, MS, RD, CDE has declared that no conflict of interest, Relevant Financial Relationship or Relevant Non-Financial Relationship exists. The target audience for this course is: entry level Occupational Therapists; entry level Physical Therapists; intermediate level Dietitians; intermediate level Nurses; in the following settings: Rehabilitation Settings.